Wir reisen in die Schweiz im September! Walking three miles is easy when you're holding hands with a blue-eyed boy and planning your future travels together. That's what I did this afternoon. Between laundry and other chores, between writing computer code and watching Friends, we decided to take a walk. It was a lovely day. Seventy degrees and breezy, not a cloud in the sky. And it felt good. Our pace was brisk, but it matched the energy of our dialogue. 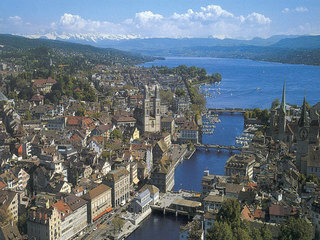 You see, beyond the trip we just completed to Seattle last weekend, and beyond our planned trip to Las Vegas in August, we just booked a trip to Zurich, Switzerland for September! It's a city we've both always wanted to visit. Beyond the draw of the chocolate, the pocket knives and the neutrality is the sheer mystery of what is considered to be one of the cleanest, most efficient, financial centers in the world. It was the backdrop for a portion of The Bourne Identity; it is the headquarters of several major banks... the kinds with the palm readers and retna scanners. But we've discovered that it is also the home of pristine waterways, a mild climate, and it rests within view of the Alps (which makes Jonathan very happy). Ancient, stone buildings are intermixed with clean concrete and glass skyscrapers. Rolling countryside is within a few miles of the city center and public transportation makes getting anywhere easy. The single drawback, and this is only a potential drawback I suppose, is that the spoken language of the Zurich canton is Swiss-German. Apparently, this is vastly different from standard or "high" German. So, while I've recently begun teaching myself German (the Rosetta Stone software was a birthday gift from Jon this year), it may only come in handy from the time we arrive in Frankfurt and the time we cross the border. That's only three hours! Switzerland is divided into three sections. While the majority of the country speaks primarily Swiss German, a fraction in the West speaks French and a smaller fraction in the South speaks Italian. English is also spoken, so perhaps we'll be able to rely on that. But the worst part is that, even if I had the inclination to learn Swiss German before our travels began, I couldn't. It's not a written language. Spoken only. I'm equating this in my head to some sort of very advanced slang... which may be ignorant, but I'm stymied here. Why isn't there a way to see it? Especially if it is the primary mode of communication for a million Swiss citizens. Oh well. At any rate, I'll continue with the German because it's challenging and completely different from the French I took for three years in high school. Boy do I wish I remembered more of that! There are many more details to hash out between now and the end of September, but for now I'll concentrate on sucking the juices out of my guidebooks and daydreaming about a stroll down the Bahnhoffstrasse as the setting sun drenches the Alps with red light. Yes, discussing all of these things made the three miles this afternoon fly by.